The Miningers have been in the ministry over 45 years. For the first 17 years they served as Sr. Pastors and the last 28 years as career missionaries to E. Europe and Scandinavia. Today, their work exceeds 15 nations. They excel in street preaching, prison ministry, much radio and some TV. God has given them favor to evangelize on Russian and Ukrainian military bases where they have witnessed countless hundreds of soldiers come to Christ. Of course these missionaries have a passion for the church and for raising up leaders who can serve in Spirit and in truth. Much of their ministry consists of speaking at conferences and planting 26 churches. The Mininger’s have a School of Ministry associated with Advantage College. From this school, Diplomas of Ministry have been granted to 918 leaders from 5 nations. In recent years, the authorities of Larry and Deborah recognized a calling and skills to plant churches. They encouraged them to complete all courses from Dynamic Church Planting International and become Master Trainers. That was accomplished at the end of 2014. It caused the church planting aspect of their ministry to include Scandinavia. Now leaders who have a good foundation in Bible are equipped to move in the Holy Spirit among any ethnic. In the last 19 years, Larry authored 3 books; Recovering The Inner Witness Of The Spirit, Improve Your Swordsmanship and Pentecost Factor. The latter title is being launched in the Summer of 2019. Be Spirit Led To . . .
– Recognize both need and potential! – Raise up leaders who plant and grow holy impact churches! – Develop resourceful individuals/teams to help struggling churches stand up! The Miningers were senior pastors for 17 years in CA before spending the last 28 years serving as missionaries in E. Europe and Scandinavia. They have active ministry in over a dozen nations. Planting churches is a major focus of their work. God graced them for 26 church plants in various regions of the world. Besides preaching on the street, in prisons and schools, on radio and TV, they are also international conference speakers. Their heartbeat is to train local leaders to take their place in the harvest. 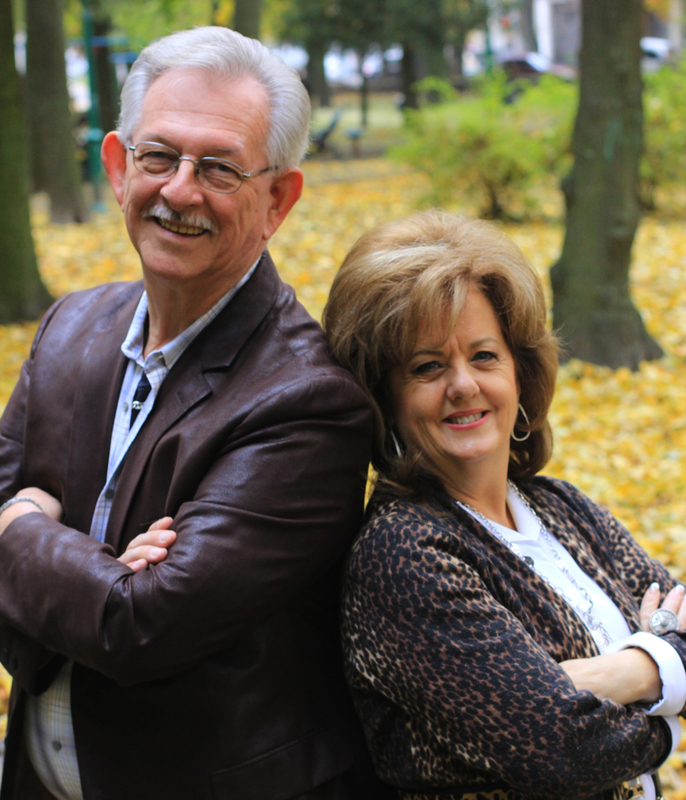 Larry and Deborah developed a School of Ministry (SOM) that is associated with Advantage College. When the SOM is completed, they are authorized to confer a Diploma of Ministry. They are also Master Trainers of Dynamic Church Planting International. Finally, God has moved on Larry’s heart to author 3 books to help Christians mature! Larry and Deborah Mininger began their ministry in 1975 as Assistant Pastors in Santa Cruz, California. On graduation from Bethany Bible College in 1977 they took their first senior pastorate in Folsom, California. From 1977 to 1990 they served as senior pastor to four charismatic churches. It was 1985 when missions was first born in their heart while on one of many 6 week trips to Brazil and Finland. Lamp Lighters International Ministries became a reality in the late 1980’s. In the beginning of 1990 the Lord spoke that they should get serious about a missions ministry. They obeyed and resigned from their church and made preparations for the field. They sold their home and proceeded to set their feet on the foreign soil of the USSR in January of 1991. It was a key time for preaching on the streets, in homes, schools, prisons and in churches that were coming above ground. Soon they were influencing new church plants from Estonia in the West to Siberia in the East and Ukraine in the South. One hour of daily prayer for 365 days asking the Lord for a crusade bus yielded results. In 1993 Pastor Roger Halvorson from the Mininger’s home church (Church of Living Waters) in Fresno, California caught the vision. He raised the monies needed in just four months. Larry and Deborah went to Luleö Sweden and bought a used full size Volvo diesel bus. They converted it to a crusade bus that sleeps 11 people with fully contained kitchen facilities. The Miningers used the big Volvo to deliver bibles and humanitarian aid to out of the way places in the Soviet Union. The bus was God’s special provision for church planting, street evangelism and bringing support and revival to existing churches. They often boarded translators, drama and worship teams with their sound equipment and instruments. There were times when 30 or more radical believers would take to the road and establish new works as the Lord directed. During that time, God opened an effective door to Russian military bases for evangelism.When the gospel was preached, literally hundreds were born again on each base. Many found their way to the newly established local churches. The Lord again changed the Miningers focus of ministry in 1999 by having them prepare a mobile school of ministry and take it to the nations. The instructions were further confirmed when Advantage College in Calfornia made them Directors of Leadership Studies. That authorized them to give every leader that completed the studies a General, Advanced or a Specialized Diploma of Ministry, depending on the courses offered in their region. The School of Ministry is not intended to substitute for a Bible education but to supplement it for experienced leaders. The school is especially helpful to those who have discovered their practical limitations. Even during an intense overseas ministry schedule and constant travel, Larry and Deborah felt the need to continue their formal education. Advantage College in Modesto, California proved to have the program of study, flexibility and instructional assistance they needed. In May of 2002 they both graduated on the same day. Deborah received her Bachlor of Arts Degree and Larry received his Master of Arts Degree in Practical Theology. Twelve years later on June 7, 2014 Deborah was conferred the Master of Ministry Degree. Use every means available to PREACH THE NATIONS. Raise up and mobilize five fold leaders for the church. Plant churches in prayerfully selected regions of the world. Provide Schools of Ministry for new church leaders. Come along side existing ministries and help them achieve their vision. Conduct regional conferences where the Holy Spirit can equip saints for the work of ministry. Create ways to fund and deploy approved leaders wherever we can make a difference for Christ our Lord!